My experience with my college seniors are good, they all are well settled so many members are placed in a campus placements. Some are regularly come to our college and share their experience with us and clarify our doubts. The gender ration in my college is almost equal there is no such thing called discrimination. Every student is treated equally irrespective of his caste,gender,race,sexual orientation,colour. Many festive parties are organised by AIMIT. There is no ragging happen in our college. College management is good. They take care of every department. Any updates or news, we get to know very easily. So, according to me i think they deserve 8/10 marks.Everything is above mark the only negative point is the fees structure which is to high as a normal family can't afford. Otherwise college is the best one. 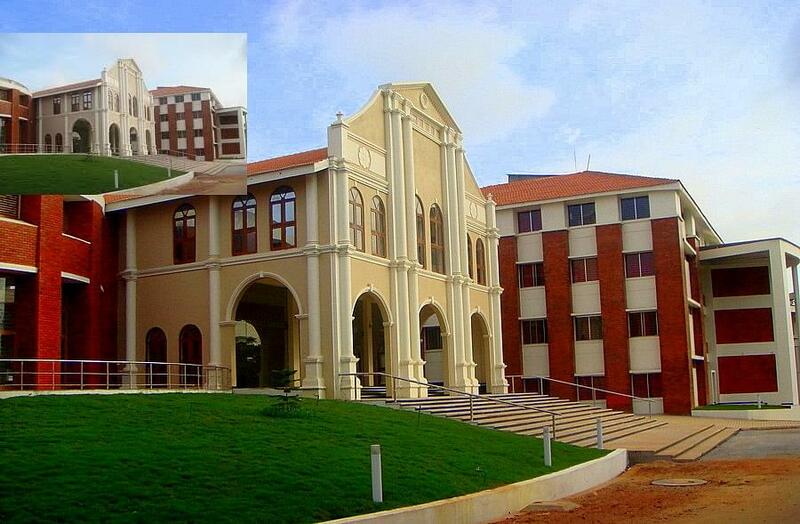 AIMIT, St Aloysius Institute of Management & Information Technology is very famous and A++ Grade college for IT and MBA. This self-determining campus is having outstanding faculty and infra-structure. 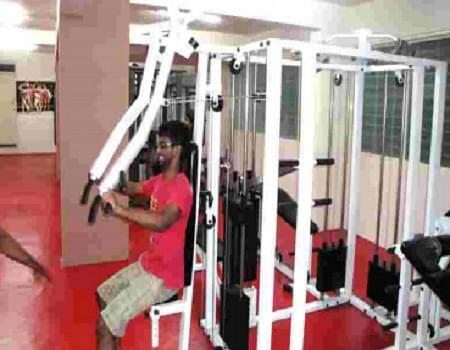 Realizing the requirement for Top class IT institute and Management, this college has started this scheme. The adjacent block to six large academic block houses, properly ventilated and air-conditioned computer laboratories. The similar type of block has two big floors of library with perfectly ventilated and air-conditioned rooms for reading. If you want to read books then library is open till late night and allow students to read their favourite books. 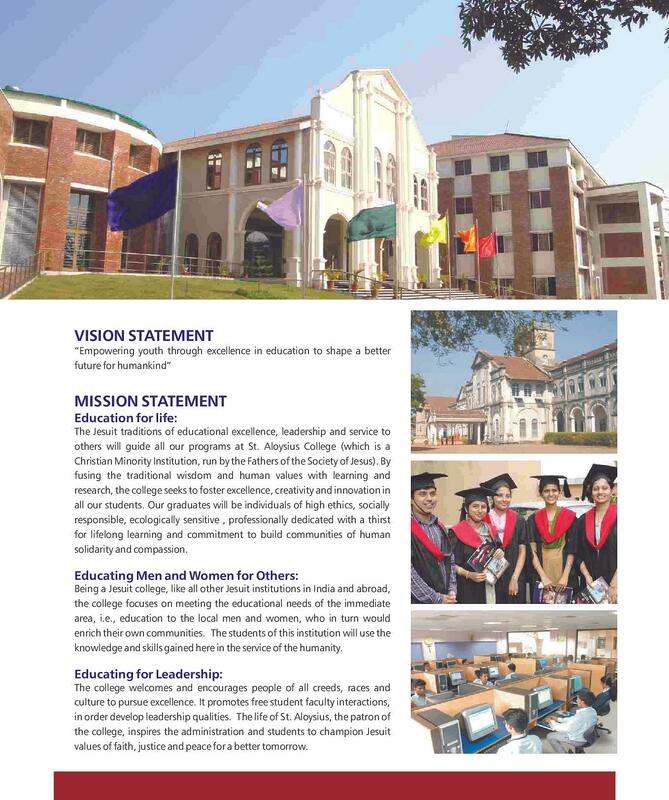 Why to Join St Aloysius Institute of Management and Information Technology? 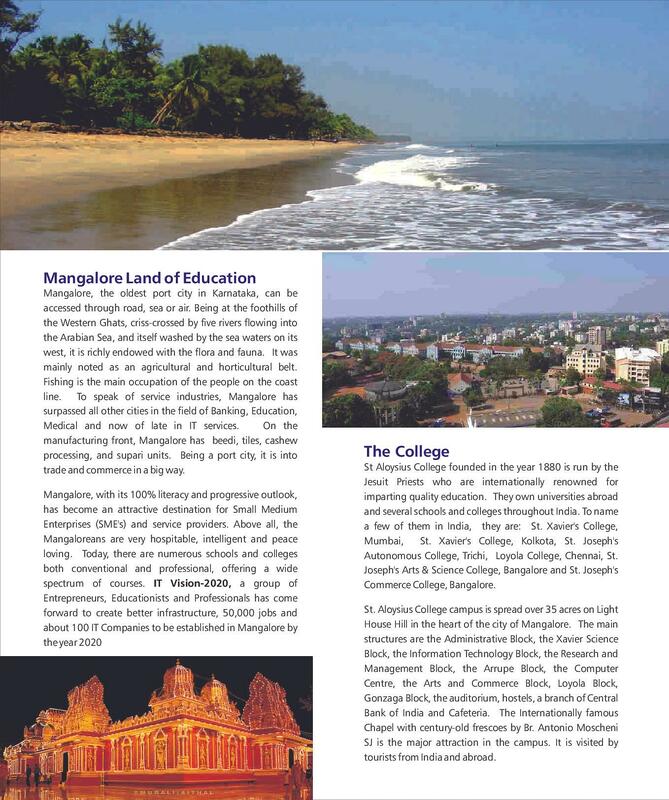 This is a top class campus for IT and Management programmes. You can get complete knowledge and get your preferred job through this college. 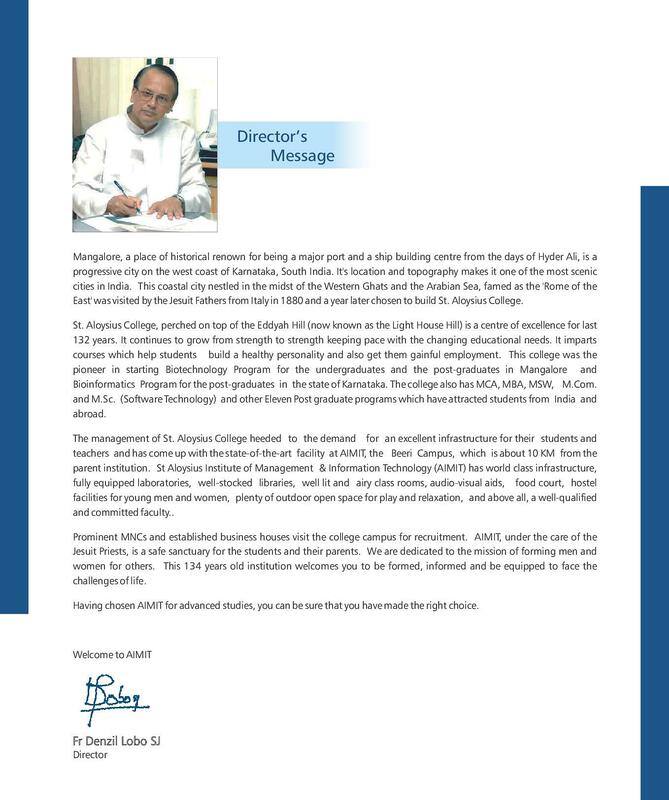 Perfect management, new campus at Beeri, Kotekar and approx 600 students can study at this place. All professional programmes like MCA, MBA, MSc. IT, PGDCA etc. Excellent and helping facilities. The Academic block, ADMIN Block, students residences, faculty housing, food court and the Jesuit residence available in the first phase of college. Properly ventilated and air conditioned auditorium, big size halls, computer labs and library. The computer labs and library are open till late hours to help students to do their studies. XAT 2020&nbsp;is scheduled in January 2020 in online (computer-based) mode. XLRI, regulating body of the exam will release the official notification shortly at xatonline.in.&nbsp;MBA-aspirants seeking admission into Post Graduate Programs in Management can apply in August 2019. I have gave KMAT entrance exam to be here in this college . I chose mba because i want to join my family business after college and Mba would be helpful in that.and i helped me a lot in my business as i have studied this course from a very renowned college and i am very thankful to that. 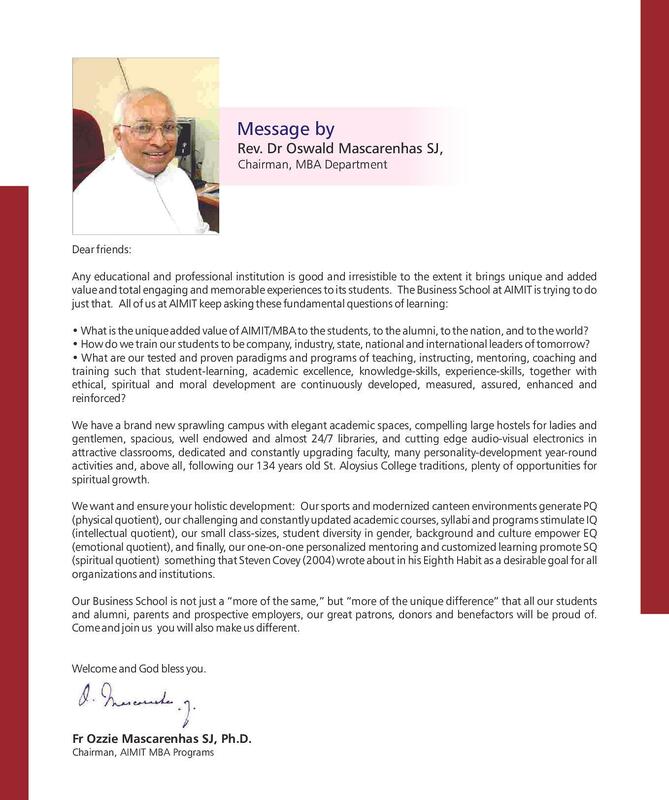 There is a entrance test to this college which is KMAT to pursue MBA course. I choose MBA to make career in management line. I opt for Aloysius institute of management and information technology because it is a very good college have heard amazing reviews about it and its faculty. I took KMAT entrance exam at Aloysius institute of management and information technology, got very well in in that to get admission. I wanted to do course in the renowned university for a long, couldn't join for my graduation but managed to get into the master degree this is an experience of a life time.